This was after the first day of building, first I jig-sawed out some chopping board blocks, then cleaned them up on the milling machine. Then I marked out, drilled and bored out the holes where they were needed and the pockets for the motors to sit in. Then I machined the rest of the frame into shape. The curves on the back were fairly simple to do using a jig I had already made up. The curves around the weapon mount were more difficult as I had already bored them out to 26mm to fit the bearings. I hole-sawed out a 26mm plug to sit in the middle of the hole, sanded a few tenths of a millimetre off it and lubed it up. It worked great. 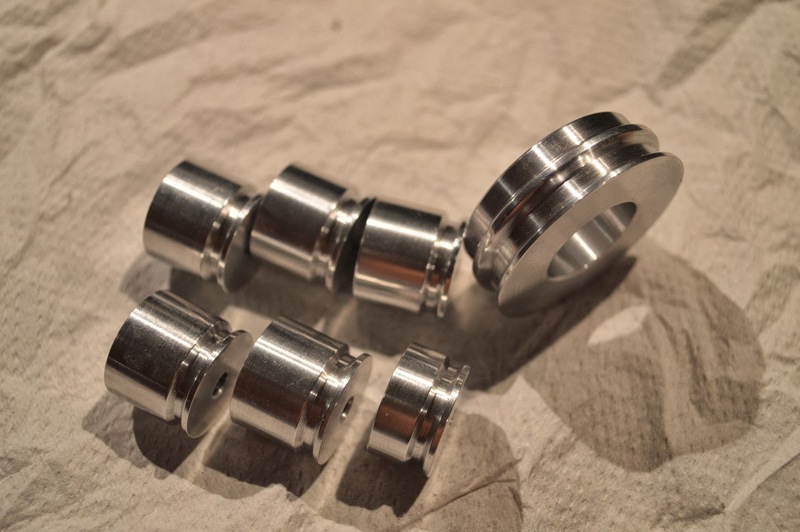 These are some rather wonderful pulleys that my good friend Ellis made up on his lathe. Every time I need round parts I just bully him until he makes something shiny. Here are 5 (4+1 spare) drive/hub pulleys, one slightly shorter one to fit on a brushless motor and a large pulley to fit on the eggbeater weapon. The drive pulleys are actually pretty clever. 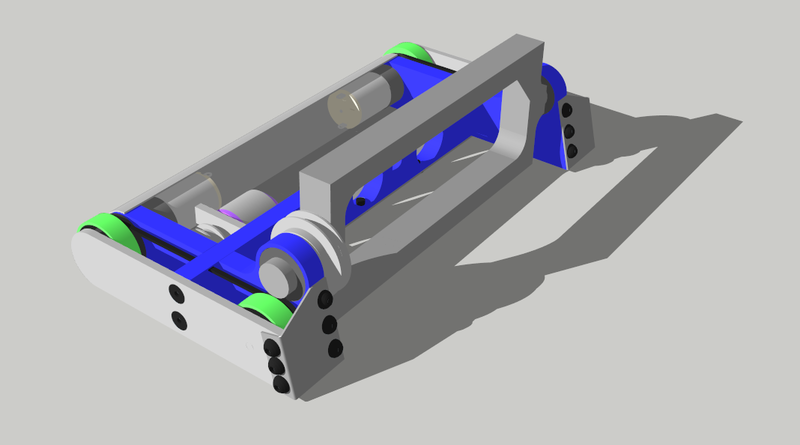 The wheels I want to use are Banebots ones, which have a 1/2" hex bore. The adaptors for which are too bloody expensive for me, so I thought I would have a go at making my own hex adaptors onto the body of the pulleys (why they have quite a lot of meat one end) I poked the numbers and grudgingly did some maths and began making chips. Here is the robot with all the pulley blanks on. Just to test the pulley groves I slung a couple of hair bands on as to be pseudo belts. Well it certainly looks like a thing! Ok well that went better than expected. The pulleys have now been fully "hexifyed" and have been pressed into the Banebots wheels. I made the hex slightly oversize so the press fit would be pretty fookin tight. You can also see where I added a grubscrew by drilling and tapping a hole in the hex so it fits on the "D" shaft of the motors without slipping. Here you can see the parts of the robot being put together. I made the belts up from some material kindly given me by the multi AWS winner, Scott. The belt was cut to length, then using a jig clamped in place and melted together to create like a large O ring belt. Works surprisingly well although it needs to be tighter than I thought. I think I can cut another 5-10mm out of the belt length and improve the drive. That's pretty much it for now. I need to get the armour made when my aluminium arrives and source some thin carbon fibre or .5mm titanium for the base plate. Will update again soon with either more of this, or some Massacre. Yep, those are definitely wheels. You may be wondering why exactly I decided to stick the tires on before pressing the inserts into the wheels. My awns er is because A, I didn't have any inserts yet and B because I wanted to have a propperish looking pretendobot. That's all for now, probably more progress next week. Cheers, Haz.